Pokédoll charms have been around since the early 2000s. They were first released in Japan in a number of random and, now, very-hard-to-find sets. 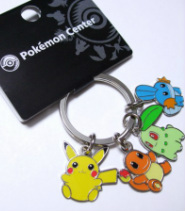 Each set of charms was sold at Pokémon Centers and consisted of three to four Pokémon looped onto a sturdy keyring. When a set only consisted of three Pokémon charms, it was often accompanied by an item charm. Throughout production, these items have included a Poké Ball, Master Ball, and Pokédoll Tag. The charms were never given an official name by the Pokémon Company, so finding any information on them other than through old Pokémon Center advertisements or actual charm owners is very difficult. Names for the charm sets range from "four-character keyrings" to "Pokémon Metal Charm" to the familiar English name of "Pokédoll charms." The first few sets of Pokédoll Charms were officially released in Japan in 2002. Shoppers could purchase a three character and item charm set at the Pokémon Centers located throughout the country. These first few sets include some of the rarest charms to date; Umbreon, Espeon, and Celebi are just three of these "impossible-to-find" rarities. March 21, 2003 indicated the second installation of Pokédoll charms. 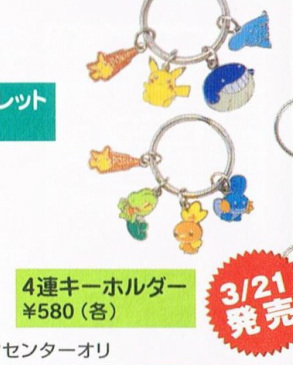 A charm set including Pikachu, Wailmer, Wynaut, and the Pokédoll tag was released along with another set including Torchic, Treecko, Mudkip, and the Pokedoll Tag. Just like the 2002 releases, these charms are quite difficult to obtain. In 2004 Pokedoll charms made their way to the other side of the world and straight into the New York City Pokemon Center. Shoppers in America could now buy the first DX charm set featuring Charizard, Mewtwo, Rayquaza, and Salamence. 2005 brought another batch of Pokedoll charms to Japan, this time commemorating the newly-released games Pokemon Mystery Dungeon: Red Rescue Team and Blue Rescue Team. Pikachu, Charmander, Chikorita, and Mudkip were now for sale in a slightly larger size than charms that had only been released before in America. These DX charms were available for a limited time following the release of the games on November 17, 2005. Another set of DX charms was released afterwards, this time featuring the middle evolution starters: Grovlye, Marshtomp, Corphish, and Combusken. Oddly enough, these Pokémon became some of the key characters in the future Pokémon Mystery Dungeon: Explorers of Time and Explorers of Darkness video games. Pokedoll charms were released in their normal size again in Japan of 2005. Weavile, Bonsly, and other Sinnoh Pokémon were now available in charm form. It is much easier to locate these individual charms than any of the earlier releases. On July 13, 2013, three new Pokedoll charm sets were released at the Pokemon Center in Japan, eight years after the previous release. These sets were originally sold for only 600 yen. These new sets re-released the original Charizard, Mewtwo, and Pikachu charms. 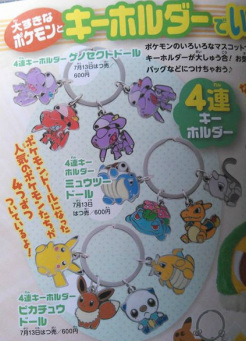 Brand-new charms were also introduced as well, including Dragonite, Eevee, Blastoise, and Venusaur. The 2013 release accomplished two new firsts; Genesect and Oshawott became the first Unova pokemon to receive a metal Pokedoll charm and the first shiny Pokedoll charm was released, containing three regular Genesect and one shiny red Genesect. Less than a year later on June 28, 2014, four new Pokedoll charms sets were sold for 650 yen at the Pokemon Center in Japan featuring some old and new fan favorites. The first set features event-exclusive legendary Pokemon, including Victini, Darkrai, Manaphy, and Jirachi. Pikachu was, of course, re-released for the fifth time in a set with the Kanto starters: Squirtle, Bulbasaur, and Charmander. Kalos Pokemon were also finally added to the Pokedoll charm collection: Dedenne, Froakie, Fennekin, Chespin, Sylveon, Espurr, and male and female Meowstic. If the summer trend continues, perhaps another set of charms will be released in Summer 2015! Other Pokedoll-style charms have been released, but are not included in this section. Visit the 'Other Charms' section to find out more! If you have other information, pictures, Pokémon Center ads, or anything else related to Pokédoll charms, don't hesitate to contact me at godudette@gmail.com!